1 tube of choice – I used the adorable artwork of Janna Prosvarina which can be purchased from Digital Art Heaven. 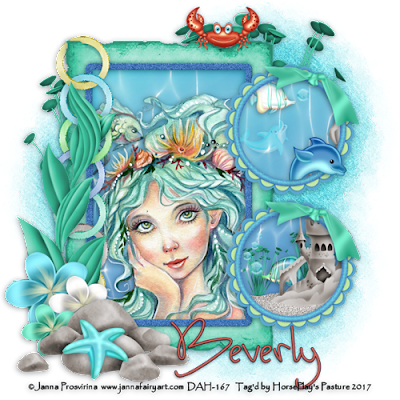 “Seashells & Sandcastles” is a tagger size scrap kit created by me, Bev of HorsePlay’s Pasture Designs and can be purchased from Digital Art Heaven here. You can visit my blog here. Don’t worry about placement yet. Merge Visible the two small round frames. Copy and paste Paper 2 Into Selection. 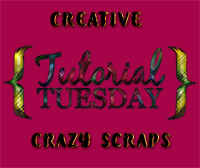 Copy and paste your tube below the frame as a new layer. Highlight the layer with the merged two small frames. Make your Magic Wand active and click inside of each. New Raster layer below the frames. Highlight the paper layer that belongs to the small round frames. Click anywhere outside of the papers. 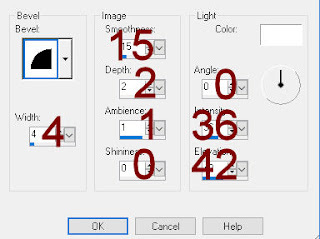 Highlight each element that overhangs the frame and tap the delete key. This tut would have been nice if all the elements were included. What a waste of my time!